Cycling is one of the trendiest forms of exercising, which is no surprise considering the massive and ever-growing number of cycling classes offered throughout every city of the country. But going to the gym isn’t for everyone, some prefer to build their perfect gym at home. Buying a spin bike for home use eliminates the need to go to the gym, which can be intimidating and sometimes just impractical. But what’s more practical than having a spin bike at home that you can use at any time? Nothing. That’s why we’ve rounded up five of the best spin bikes on the market and everything you need to know before you choose one. Finding the right exercise bike can be tough, especially once you see the huge number of options available to you online. Do you need a display? How heavy is it? Will it fit in your garage? How much resistance can it put out? Shopping online can make things a lot more difficult, since you can’t test it out in person and returning a heavy piece of equipment is a pain. But not to worry… We’ve tested all the top brands and models and reviewed our top 5 favorites below. In this article, we’ll discuss the pros and cons of each spin bike, factors to consider before purchasing, and tips on how to select the best spin bike for your particular needs. Why Buy a Spin Bike for your Home? Spin bikes provide an alternative to cycling, without compromising the intensity of your workout. Spin bikes are different than traditional exercise bikes because they more closely mimic actual outdoor cycling. Spin bikes allow you to get the full experience of outdoor cycling without exposing yourself to the elements. This makes them a great option for intense cardio year round, no matter what the weather is like. Using a spin bike and cycling indoors eliminates certain struggles associated with cycling, including switching lanes, keeping up with traffic, and flat tires. Spin bikes also require way less gear than regular cycling, since you don’t need a helmet or pads, and provide an overall less stressful and more enjoyable workout. You can relax on a spin bike in a way that you couldn’t do while cycling on the road. One of the most obvious benefits of spin bikes is the fact that they are great for weight loss and really burn up those extra calories. Just an hour on a spin bike on moderate intensity can burn over 600 calories depending on your weight and metabolism. But even if you aren’t looking to lose weight spin bikes can be beneficial to your overall health, and especially heart health. Indoor cycling is considered a low impact exercise, meaning it doesn’t put a lot of weight or stress on your feet, knees, and joints. Low impact exercises are especially helpful for people who have healing injuries or sensitive joints. Low impact exercises can promote joint and muscle longevity, since you aren’t putting tendon-damaging stress on them. High impact exercises, like sprinting, can put a lot of unnecessary stress on your joints and tendons, resulting in faster deterioration and leading to injuries down the road. Lastly, spin bikes promote lean muscle growth and provide you with a full body workout. Lean muscle development gives your body a slim, toned look. Cycling can tone up your legs, glutes, and tummy, which are many people’s top problem areas. When you use correct technique and posture, you can work out several muscle groups at once, from your quads and hamstrings to your glutes and core. This makes it an extremely effective form of exercising and a key part to any good exercise regime. Save Time: We aren’t telling you to kick your gym regimen to the curb, but owning a spin bike means you can stop spending crazy hours doing cardio in the gym. Plus, when you’re able to exercise comfortably in your own home, you’re inclined to exercise more often. Comfort: The old school spin bikes with rock hard seats and awkward handlebar placement are long gone. While you do get what you pay for, most modern spin bikes are built with comfort in mind and are fully adjustable to fit your individual size. Plus, you don’t have to worry about sitting in anyone else’s sweat or dealing with excessive wear and tear. Cost: Exercise bikes aren’t nearly as expensive as they once were. There are high-end commercial models that can reach into the thousands, but fortunately for us common folk, there are plenty of quality options for under $500. ‍ Belt driven mechanism to ensure smooth and quiet workouts. ‍ Heavy-duty steel frame system with a 22 lbs flywheel.Consistant Adjustable resitance with a turning knob. ‍ LCD monitor tracks Speed/Time/Distance/Calories/Odometers/Pulse. LCD Display: The easy to read LCD display keeps track of and shows your speed, time, distance, calories burned, pulse, and the odometer. Having these stats updated in real time and just a glance away makes it easy to see your progress and can provide a source of motivation to push through your workout. Adjustable in Every Way: As you know, adjustability is an important feature for a spin bike to have, which is what makes this bike so impressive. In addition to being able to change the height of the ergonomic, multi-grip handlebars, you can also adjust the seat height and position, and of course, the 22-pound flywheel to give you varying levels of resistance. Belt Driven: This spin bike is powered by a belt driven motor, which reduces noise and ensures a quiet workout that won’t distract everyone else in your house. The belt also ensures a smoother workout, without any shakiness or unevenness. This spin bike uses fabric brake pads for resistance, which wear out over time. But they will send you replacements and this helps keep the cost low. 24/7 Access to Online Streaming Classes: Every Peloton Bike requires a membership, which gives you access to real studio classes with professional instructors in real time. You can choose from 14 live daily spin classes, with varying difficulties, impact level, and styles. The membership also gives you access to thousands of on-demand spin classes, so you can get high-quality, instructor-led workouts at any time of the day. Compact Design: This bike takes up barely any space in your house, measuring just 4′ x 2′. That makes it easy to slip into any space you have available, whether it be part of a full blown home gym, in the corner of the guest room, or in the garage. Durable Design: Most importantly, the Peloton Bike was built to last, constructed using high quality materials for every possible part. The frame is an ED and power coated welded steel frame, which can stand strong and sturdy during the most intense workouts. Other points of interest include the crank arms, made with 170 mm forged steel, and industrial grade bearings in the bottom bracket. Pulse Sensors: Built into the comfy handlebar grips are tiny little pulse sensors, which monitor your heart rate and displays it on the LCD display screen. Knowing your pulse can help you stay within your target heart rate range throughout your workout, which can help maximize the results of your efforts. Easy to Adjust 22 lb. Flywheel: The ProGear 100S features a 22 pound cast iron flywheel and a knob above it to adjust the resistance in a matter of seconds. This gives you endless cycling options, whether you want a progressively harder spin session, or just a relaxing warm up. Experimenting at trying out different resistance levels your first time on the bike can help you discover your personal sweet spot, limits, and preferences. Dual Direction Pedaling: Another useful feature is the fact that the pedals and flywheel are bi-directional, so you can pedal forwards or backwards and get the same amount of resistance. This allows you to add even more variety to your cycling routine without compromising the quality of it. Pedaling in reverse can target specific muscles, like your quads, which is why many people seek this feature in a spin bike. This bike is chain driven, rather than belt driven, which some people say creates a louder, less even ride, while others say it more closely imitates actually riding outside. Heavy Duty and High Durability steel frame construction with up to 400 lbs weight capacity. 20% more steel than the Exerpeutic Folding Magnetic Upright Bike for more maximum performance. An 8 level Magnetic Tension control system for an easier or more challenging workout. There’s nothing worse than trying to lose weight and better your health only to find that an exercise isn’t actually made for bigger people. Being there myself, I can understand how frustrating that is. Thankfully, this exercise bike can withstand up to 400lbs. thanks to it’s newly designed structure, with a composition of 20% more steel than other folding bikes that are offered from Exerpeutic. Along with this bike, you can easily store it because of its folding capabilities, and you’ll be able to comfortably sit in the large seat cushion without worrying about comfort being an issue. There’s also an 8-level magnetic tension system for better control over speed, comfort, and most importantly – your workout. One of the primary advantages of this product is how it caters to larger people. Not only can this bike withstand weights up to 400lbs. thanks to the newly improved steel structure, there’s also a large seat cushion for those that need a bit of extra support when they workout. Another advantage is that those who are limited on space will not only receive a space conscious bike but a design that allows you to fold it to half of its size when you’re not using it. Another advantage to this product is that there is an LCD screen that allows you to see how far you’ve traveled (virtually, of course), the number of calories burned, your speed, time, and other measurements from your workout. There aren’t too many disadvantages of this product, but for those that want something that’s recumbent for low-impact to non-impact workouts, you, unfortunately, have to seek the perfect product elsewhere. There’s nothing worse than an exercise bike that doesn’t allow you to adjust anything, and that’s not something you have to worry about with the Sunny Health & Fitness Indoor Cycle bike. With a seat and set of handlebars that are fully adjustable, you’ll also be able to adjust the resistance for total control. Featuring brakes that are press-down, you may also enjoy the belt drive mechanism that promises a workout that’s not only smooth but quiet. We’ve all had that neighbor upstairs that pushes as hard as they can on the loudest machine, and you won’t need to worry about bothering your neighbors. The Sunny Health indoor exercise bike comes with a lot of advantages, especially for the price. You won’t be paying an arm and a leg to get your health back on track, and one of the advantages of this product is the 49-lb. flywheel. It’s important that you have a bike that won’t move around and shake as you work out, which can not only harm you in terms of physical health but can make for a pretty unsteady ride. Thankfully, the weight of the flywheel allows for a steady and smooth workout, while providing leverage for easy transportation. We can’t see too many disadvantages of this product; however, the one issue that someone may have with this machine is that it’s not a recumbent machine. If you’re someone who needs low-impact or no impact at all, you’ll have to seek an exercise bike elsewhere. For those that do purchase this exercise bike, you won’t be seeing any disadvantages outright unless it has to do with personal preferences. The commercial grade construction allows for better durability. In having this, you won’t have to worry about replacing anytime soon, or in the coming years, as it’s meant to withstand the test of time – and your workout. The top-down brake pad system is leather, and the style of brake pad system ensures a better life span than those without. The 43-lb. weighted flywheel is more than perfect for the 250-lb. weight limit and the commercial grade construction ensures durability to last a lifetime. There are quite a few advantages, including the fixed handlebar for better ergonomics. Because of the five-degree angling of the handlebars, you’ll see better posture and less sloppy posture. Those that are new and are used to sloppily adjusting their own handlebars may see better workouts with a fixed set. There are two primary disadvantages to this spin bike, and those include the weight limit and the handlebar aspect. While the handlebars are angled precisely for better ergonomics, they aren’t adjustable and everyone’s workout is not black and white. For the price, you think you’d have more control, but sometimes it’s better for those who need it. The purchase and the aforementioned disadvantage all boil down to personal preference. Another disadvantage is the 250-lb. weight limit. It seems as if the further we go into this list; the less amount of weight that can be applied to this bike. While it doesn’t affect the performance, you run the risk of breaking an expensive piece of equipment or harming yourself if you don’t abide by the manufacturer’s suggestions. Height: 42", Length: 40", Width: 21". Weight Capacity: 300lbs.. Platform: Upright/Cycle. Adjustable seat & handlebars: Vertical/Horizontal. Felt pad brake resistance. Made in Taiwan. There’s nothing worse than wanting a long training session on one machine, only for the machine to be uncomfortable to use after a while – and in terms of equipment comfortability, not general style. With seat adjustment capabilities for the handlebar and seat, you’ll be able to adjust everything for what your body desires. Alongside this, you’re receiving a machine with a backlit LCD screen that allows you to see rotations per minute, time, calories burned, speed, and distance. There are quite a few attractive features of this product including the ability to see your rotations per minute, calories burned, distance traveled, speed, and time with the backlit LCD screen. Another advantage of this product is the smooth resistance offered by the 48-lb. flywheel. The console of this exercise machine is not only vibrant but easy to view. There are also many ergonomic aspects of this exercise bike that make it a frontrunner in the genre that it excels so well in. If you like training long distances (in terms of virtual distances and time spent on the machine), then you may enjoy the comfortability of this exercise bike. If you have a bad back or if you’re looking for something that betters your posture, you may want to look into a recumbent machine, as this one leans you forward quite a bit. The aforementioned only affects the performance of the product if your body cannot handle it, but it is something to consider since back pain is a common problem. 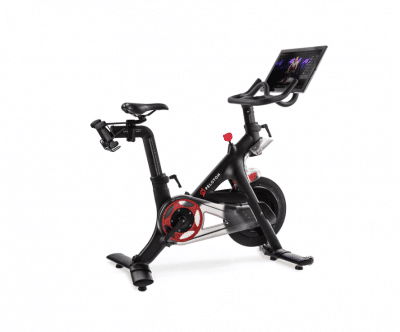 EXCELLENT CARDIO WORKOUT -The Marcy Club Revolution Cycle Trainer is a piece of indoor equipment that allows you to experience an intense cardio workout even in a stationary position. 40 lb. Flywheel: The heavy duty, balanced 40 lb. flywheel makes your workouts both more enjoyable and more challenging. You can fine tune exactly how much resistance to put on the flywheel by adjusting the resistance knob. This allows you to get a more casual, laid-back workout or an intense- heart-pounding workout depending on what you need that day. Ergonomic Bike Seat: An uncomfortable seat is one of the fastest ways to guarantee a spin bike won’t get any use. That’s why the ergonomic, adjustable design of the Marcy Club Revolution Trainer is such a big success. You can adjust it horizontally and vertically to fit your body and spin for hours. Basket Cage Pedals: Unlike regular bicycle pedals, which can be uncomfortable and slippery, the pedals on this spin bike are designed to maximize comfort and prevent slippage. The basket cage design allows you to slip your foot in the pedal and have it stay secure throughout your entire workout. LED Digital Monitor: The LED digital monitor on the Ancheer M6008 keeps track of things like your speed, distance, calories burned, and more. The monitor isn’t huge and distracting and won’t take your focus away from your routine. The monitor display makes it easy to set goals, stick to them, and know when you’ve accomplished them such as cycling for an hour, or burning 500 calories. Felt Pad Resistance System: This spin bike uses felt pads to apply friction resistance to the flywheel. The pads are easy to replace, and when used in conjunction with the belt driven motor, ensure a smooth, quiet ride. They are the perfect solution for people who want to get the full cycling experience at home without spending thousands of dollars. Extra Stable: The durable steel frame of this bike actually has a trick up its sleeve, with stabilizer bars and 4 adjustable levers for stabilizing the bike on uneven ground. This is super helpful because if you get a spin bike and discover your floor is uneven, usually the only option is to put up with a wobbly bike or slip a box of matches under the corner and hope for the best. The only downside to this bike is the fact that there will be regular maintenance required, such as changing the resistance pads. There are a couple key things you need to think about before you hit the purchase button. Your personal taste will obviously play a key role, but objectively you should be thinking about 3 things; your fitness goals, your space requirements, and your budget. What Type of Bike Do You Want? There are two main types of bikes – recumbent and upright. What’s the difference? Simple; a recumbent bike has a reclined position whereas the latter is used sitting upright or leaning forward. The recumbent style of bike is better for more leisurely workouts. Seniors and those with joint or posture problems may seek out a recumbent bike due to its ability to provide an easy low-impact workout. For most everybody else, we’d recommend a traditional spin bike. There are a few different types of resistances offered on an exercise bike, but the most common type of resistance you’ll find on a spin bike is magnetic and friction resistance. Both forms add resistance to the flywheel of the bike, creating a more intense workout, but do so in different manners. Spin bikes with magnetic resistance usually have 2 magnets, one on each side of the flywheel, which add more or less resistance depending on how close together they are, without ever actually touching the flywheel. On the other hand, spin bikes with friction resistance use one or two one or two pads, resting on the flywheel, to put more or less physical resistance on the flywheel. This form of resistance tends to be more cost friendly initially, but the resistance pads will wear down over time and need to be regularly replaced. Magnetic spin bikes tend to cost more than friction bikes, but they require less maintenance and produce less noise, making them many people’s first choice. Before choosing a spin bike, you should consider your budget and what features are most important to you. There are no hard rules when it comes to budgeting, other than stay within your means. When you’re starting a new exercise routine it can be tempting to go all out and get all the best equipment, but this isn’t necessary for beginners and you can run the risk of losing a lot of money if you don’t keep up your exercise routine like you planned. If you are working on a tight budget, you may choose to get a spin bike with friction resistance and a few extra bells and whistles, or you may choose to get a simpler spin bike with magnetic resistance, it’s just a matter of personal preference and needs. One thing that is certain when it comes to choosing a spin bike is that it needs to be adjustable and comfortable. From the bike seat to the handles and pedals, the more comfortable a bike is, the better, so be sure to pay attention to every part of the bike and what kind of materials are used. Adjustability is also important because it’s what allows you to customize your bike to fit your body and customize your workout to fit your needs. When shopping, you should look to see what parts of the bike are adjustable. Can you change the position of the handles? Is the seat adjustable? If so, in how many directions? How many levels of resistance does the flywheel offer? All of these are questions you should be asking yourself when comparing and shopping for spin bikes. If you’re limited on space, like most people, you really need to consider your home storage requirements and where your bike will be located in your home. You’ll also want to consider the weight of the bike, especially if you live in an apartment or plan to place the bike on the 2nd or 3rd story of a home. Most spin bikes today are electric but there are also manual machines that tend to be much smaller and lighter (and cheaper). Is a Computer Monitor Important? Some spin bikes come with a computer display that shows your current stats, like your heart rate, resistance level, calories you’ve burned, how long you’ve been cycling, and more. Not every spin bike has a computer display, and not all computers keep track of the same data. So first, you’ll need to decide if a display is important to you. If it is, you’ll then need to decide what kind of things you want the display to show and search for a spin bike that meets that criteria. Spin bikes can come with many little features that make exercising more enjoyable and possibly more comfortable, but they don’t necessarily add to the bike’s overall performance. Still, it’s always nice to have amenities like a water holder, cooling fan, or speakers for listening to music. Having these features can motivate you to actually use the bike more, so I recommend trying to get as many “luxury” features as you can afford. When you purchase a bike, you’ll want to take a look at the measurements and know your general measurements. When a bike doesn’t fit the contours of your body, you’re not going to be comfortable, thus leading to yourself being unmotivated. Whether you seek assistant from an online representative or go somewhere in person, you may need the opinion if you think you’ll need the non-standard in terms of size. Your height versus the handlebar height is extremely crucial for comfortability – especially for those that are too short or too tall. Researching more on this will allow you to seek out the best spin bike possible. Always keep your upper body relaxed! If you can’t be comfortable in your upper body as you work out, the impact will be harsher on your upper body – and not in the good way. There’s a general tip of your shoulders needing to be away from your ears, rather than scrunched up, as you’re hurting your posture and your spine. For those that are repeatedly partaking in this type of posture, you’ll feel more sore in the bones and actually cause damage to your posture over time. Let’s take a look at some of the best products on the market currently. Although all of these bikes make fantastic indoor trainers, there is one clear winner once you factor in performance, cost, durability, and aesthetic, and that’s the L Now Indoor Cycling Bike. The Peloton Bike might have seemed like the obvious winner because it is the highest end bike, but that doesn’t make it the most practical. The L Now is more affordable and once you buy it you don’t have to pay for a monthly membership to use it. The L Now provides the best overall value, with a handy LCD display, an abundance of adjustable parts, and a quiet belt driven motor. Users love the fact that it’ also Bluetooth enabled and able to pair with all the top Bluetooth headphones. Finally, even though you will have to replace the resistance pads every so often, it’s a simple process and they make ordering replacement really easy to do. The resistance pads are also significantly cheaper than a magnet resistance system, but if your heart is set on a magnet bike, you should look into the Peloton. But no matter which bike you choose, what’s important is that you stick to your workout plan and use your spin bike in order to see the slimming and toning results you want.